At the tail end of the iPad Pro presentation on Wednesday, Apple announced an updated iPad mini with a slimmer profile, lighter weight, and higher-performance internal components. Apple marketing chief Phil Schiller said that the iPad mini 4 weighs in at just 0.65 pounds, but packs the same internals as the iPad Air 2. That means Apple's A8X processor, M8 motion coprocessor, Touch ID sensor, and 1 gigabyte of built-in RAM. For iPad-friendly photographers, the new mini also includes an updated 8-megapixel rear camera. The iPad mini 4 will slot in toward the lower end of Apple's iPad lineup, starting at $399. The iPad mini 3 will no longer be sold, while the iPad mini 2 will hit the bottom of the product line at $269. There is no word yet on exactly when the fourth-generation mini will go on sale, or what the storage options will be once it does. 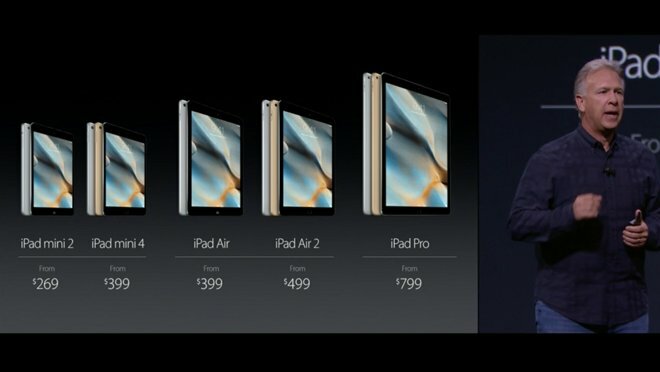 It seems a good bet to mimic the 16-, 64-, and 128-gigabyte options of the balance of the iPad lineup.